(3 February 2019) Construction on the US$6 billion China-Laos railway carried on throughout the Spring Festival on 5 February, also known as the Chinese Lunar New Year, as engineers sought to take advantage of the favourable dry season in Laos to ensure that the project remains on track for completion. According to the Laos-China railway joint working committee, the project is entering its most crucial phase and the Spring Festival stretch was to be used to construct the beams of the longest-ever railway bridge in Laos. Construction of the 414-kilometre cross-border rail line commenced in December 2016 and is expected to begin operations in December 2021. 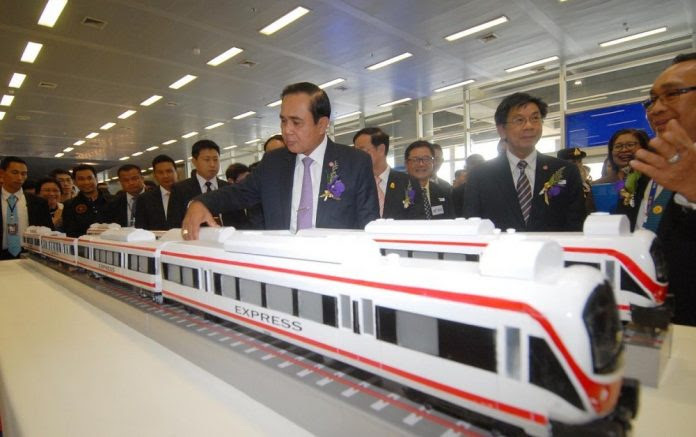 (31 January 2019) Thailand will opt for domestic funding to fund 80% of the construction of the US$57.13 billion high-speed rail connecting Bangkok with the northeastern province of Nakhon Ratchasima. The project was initially encouraged by the Chinese government, who sought to link Thailand’s rail network with Laos’ under the Belt and Road Initiative (BRI). However, mounting public concern that funding from China would put the country at a disadvantaged position led the Thai government to instead seek funding from domestic sources with more favourable terms. The Finance Ministry’s Public Debt Management Office further clarified that China will not be a co-investor in the project and that it would only provide assistance in the development of technological and system infrastructure. (1 February 2019) The China Railway Eryuan Engineering Corporation (CREEC) began a partial ground survey for the proposed Muse-Mandalay-Kyaukphyu railway line, despite the Myanmar government’s noncommittal stance on the project. The parties involved signed a memorandum of understanding in October 2018 and a committee was formed to study the project’s feasibility. Despite this development, concerns remain over the financial and military implications that China’s heavy involvement would have on Myanmar. For instance, Myanmar Railways’ general manager of planning and administration U Htaung Shan Khan was quoted saying that completion of the CREEC’s survey does not guarantee that the project will be greenlighted, and approval of the project also depends on the outcomes of discussions between the government and public. (2 February 2019) Cambodia saw a massive 70% rise in Chinese tourists last year compared to the previous year, with total numbers reaching two million tourists, stated Cambodian tourism minister Thong Khon. The increase marks the second consecutive year in which Chinese tourists have topped the total number of foreign visitors to the country. In 2017, Cambodia welcomed 1.2 million Chinese tourists, who generated US$3.6 billion in revenue for the country. As such, Cambodia sees Chinese tourists and investments as a key factor in advancing its tourism industry. It also projects that the number of Chinese tourists will reach three million per year by 2020, five million by 2025 and eight million by 2030. (31 January 2019) The Central Bank of Myanmar (CBM) introduced the Japanese yen and Chinese yuan as settlement options for banks in cross-border payments and transfers. The move is one of a slew of major reforms announced by the government recently, which includes allowing foreign banks to provide loans to domestic firms. Similarly, the National Bank of Cambodia (NBC) also announced that the yuan and yen will now be recognized as official clearing currencies in the country. Furthermore, these announcements were followed by Bloomberg’s announcement that it would include yuan-denominated Chinese government and policy bank bonds in the Bloomberg Barclays Global Aggregate Index starting in April. According to Bloomberg, once the process is completed, yuan-denominated bonds will become the fourth-largest currency bonds in the index after the US dollar, euro and yen.